In case you are unaware, there aren’t many countries extracting oil for under $30 per barrel. Looking at the chart below, only Saudi Arabia, Iran, and Iraq will continue to produce if oil is $30. We wouldn’t have much crude oil if only these countries produced oil. Most oil companies will probably then produce KFC instead of oil. Haha? Yes, it is a threat, but it will take time. The world today is definitely nowhere near a point where we can continue to function without adequate supply of oil, coal and natural gas. Price is a function of demand and supply dynamics - simple as that! Yes, Iran sanctions have been lifted and more supply is going to flood the market. 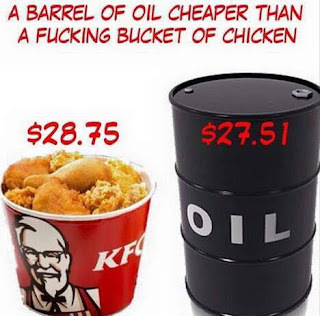 This is definitely one of the main reasons causing the steep descent of oil price. As for demand, seriously aside from China slowing economy which will result in less demand globally, demand in USA is still relatively strong. India is also seeing significant growth of oil demand. Overall, demand fundamentals are still stable. 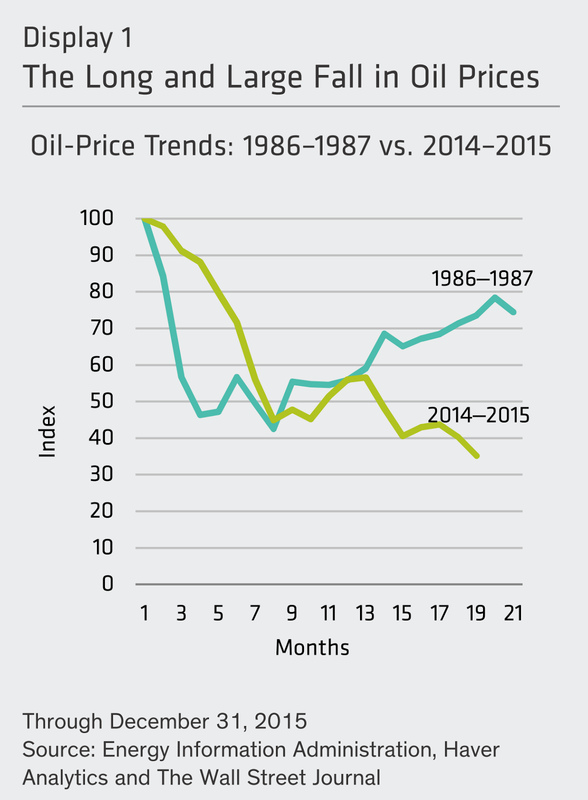 The depressed price has already led to the decline of capital expenditure from oil companies. For offshore oil, it takes years from FEED (front end engineering design) to exploration, to actual production. Unless shale oil can replace offshore oil in a short period of time or we discover other more efficient methods of extracting oil soon, we are going to see serious shortage of oil in the next few years! When will oil price stabilise? Nobody knows. It is almost impossible to predict the price of oil forward in the short term. 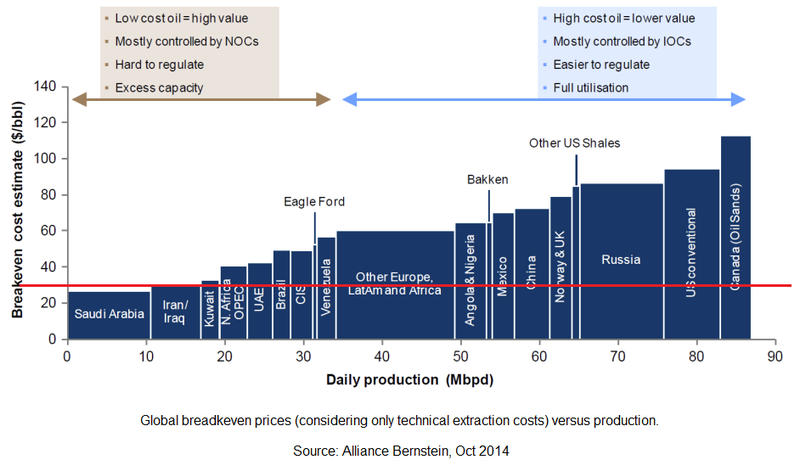 Refer to my previous article “Which directions will oil price head? What should I do now?” written last August. Yes, you can be so analytical that you may get the demand and supply figures fairly accurate, but can you predict the sentiments of people? Compared 1986 to 2015 – Lower for longer? 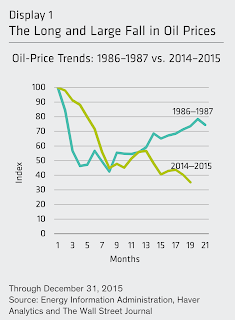 Many compared the oil peak-to-trough situation today to what happened in 30 years ago. Then, in Sep 1986, OPEC was worry by the discovery of oil in the North Sea, and increased production and lowered the price to preserve market share. This time it was Shale oil in USA. The oil decline in 2014-2016 is proven to be longer in duration as well as larger in scale compared to what happened 30 years ago in 1986-1987. Persist low oil price will result in lower capital expenditure (CAPEX) in the energy sector. Therefore there will be a decline in non-residential structures investment in the energy and mining segment. This means lesser construction of oil-rigs and related offshore construction and support vessels as well as mining related activities. Oil export-led countries will also see a huge decline in their revenues which result in budget deficit. Venezuela who has the world’s largest oil reserves, depended hugely on revenue generated from oil to pay for pensions, health care, social benefits and even to subsidize housing and grocery stores. But now, the economy is on the brink of collapse. Inflation soared over 150% in 2015 and is expected to rise over 200% next year. The government is unable to pay its bills, and food and basic supplies are in short supply. Saudi Arabia has oil accounting for 75% of the country’s revenue. It ran a nearly $100 billion budget deficit in 2015 and announced tough austerity measures for next year. "That's a reminder that even the world's lowest-cost oil producer relies on high(er) prices to balance its budget and current prices don't come anywhere close," Kit Juckes, global strategist at Societe Generale, said. Nigeria, Africa's biggest oil producer has oil accounting for roughly 75% of its revenue, and almost 90% of the country's exports. The plunge in oil prices has left the government unable to pay its bills. Local media reported that in some regions, state employees haven't received salaries in months. The country is suffering from power cuts and fuel shortages. Russia has almost half of Russia's government revenue coming from oil and gas exports. Russia’s budget is based on an oil price of $50 per barrel. With oil trading so low now and the country who already suffered from the Western economic sanctions, IMF expects Russian GDP will shrink by ~4.5% in 2016. Malaysia has until 2014, about a third of government revenues came from Petronas. Its budget this year was also based on assumed oil price of US$48. Each US$1 drop in oil prices slashes RM300 million from its annual revenue. The current oil volatility will definitely create lots of uncertainty in the economic outlook going into the course of future. This is going to affect many decisions of policy makers including Fed decision to raise rates. With oil price at all-time low in the last decade or so, many governments are likely to revise the numbers of their economic assumptions for the 2016 state budget. A list of energy-related companies in Singapore such as Keppel O&M, Semb Marine, Ezion, Ezra, Swiber, Nam Cheong, Pacific Radiance, POSH, Marco Polo, Swissco, MTQ, have all seen their stock prices battered down. On the flip side, lower oil price will result in a steady source of cost savings for many businesses who are largely dependent on fuel and electricity. The low oil price will greatly benefit transportation companies who can consume lower priced fuel. Airlines and transportation companies may see this as a good time to upgrade or grow their fleets. Companies such as Singapore Airlines Ltd and Comfort Delgro will see reduced fuel costs to their benefits. For SIA, fuel costs contributed to 37% of overall expenses in FY2015. Other companies who sell trucks or involve in delivery such as FedEx, UPS etc will be beneficiaries as well. Spending on services such as having meals away from home and domestic travel can increase as well. In some way, companies in the travel, consumer/retail and F&B segments can possibly benefit from the current low oil price environment. Investment in manufacturing structures will potentially see a huge increase over time. For countries who took a long term view, this may be one of the best opportunities to invest in infrastructure and connectivity as well. Other than countries who are net importer of oil, major producers of refined fuels in Asia include South Korea, Singapore, Japan and Taiwan that rely on crude oil imports to supply the sector will stand to benefit as well. Stay tuned to part 2 for Rolf's views and the Dos and Don'ts in this crisis. Hey Rolf, just wanted to say I really enjoy your articles on oil/energy. Even if not for investment related activities, still fantastic general knowledge to have - pls keep writing! Thanks a lot. Your kind words add more "oil though quite cheap now" but necessary to drive my writing engine! Your well worded-blog inspired me as well. If not how to get recruited to write for Trade magazine? The recruitment is for some small unimportant online portal not big trade magazines. It boils down to few factors - Coincidence, luck and "guan xi". Writing professionally and blogging or writing to peer is totally different. I can easily spend 10-12 hours or more researching/writing/re-checking an article between 1000 - 1500 words, prior to submission. It's very tiring! Money is never easy to earn, considering the fact that many naive investors thinking how easy it is to earn from stock markets! LOL! I old school lah. I still consider newspapers and magazines as "mass media", but to the young, they all roll-eyes at me. I think the days of print media are numbered. Penthouse print version ended; now that's a good indicator of the future! Press a few buttons and in a few minutes, we'll get immediate feedback. LOL! Old school.. yes I noe, black T, light colored jeans n new balance shoes! Trading is easy... Easy to loose money! I could not have claim credit for the KFC comparison because it was courteousy from a good friend of mine! Like u, I find it very nice and feels like sharing here. My name is Andy James currently living in Zurich Switzerland,Am writing this letter because am really grateful for what Elvin Morrison did for me and my family when I thought there was no hope he came and make a way for me and my family by lending us loan at a very low interest rate of 2%. I never thought that there are still God sent and genuine loan lenders on the web but to my greatest surprise i got my loan without wasting much time so if you are out there looking for a loan of any amount i would like to recommend you to Elvin Morrison the Managing director of Elvin Loan Company because he is a God sent man that can change your life forever, So if you really want to make a better life without any fund scarcity I would advise you to get in touch with him through this e-mail below elvinloancompany@yahoo.com or call on +13072132540. Hello, I am Desmond Cloud currently living in CT USA, God has bless me with two kids and a lovely Wife, I promise to share this Testimony because of God favor in my life, 2days ago I was in desperate need of money so I thought of having a loan then I ran into wrong hands who claimed to be loan lender not knowing he was a scam. he collected 1,500.00 USD from me and refuse to email me since then I was confuse, but God came to my rescue, one faithful day I went to church after the service I share idea with a friend and she introduce me to JEFFERY SMITH LOAN COMPANY, she said she was given 98,000.00 USD by MR JEFFERY SMITH , THE MANAGING DIRECTOR OF JEFFERY SMITH LOAN COMPANY. So I collected his email Address , he told me the rules and regulation and I followed, then after processing of the Documents, he gave me my loan of 55,000.00 USD... So if you are interested in a loan you can as well contact him on this Email: (jefferysmithloancompany@gmail.com) thanks, I am sure he will also help you. Is that good for the economy? Anyway, for getting church loans churches should be quite alert about charges, outcomes, hassles, guarantees and also paying off schedule. Griffin Church Loans is a very trustworthy lender in this case. start off your business proposal or expansion? think there is no way out, and your financial burdens still persists? Really? I wish, church building cost will fall. The church loan in USA requirement is really high but finding a right lender is not that tough with the help of church lender's directory. We are back with the best international financial service rendered to the general public with maximum satisfaction, maximum risk free. Do not miss this opportunity. Join the most trusted financial institution and secure a legitimate financial empowerment to add meaning to your life/business. ( BEWARE OF DUPLICATE OF THIS ADVERT WERE NAME AND EMAIL ADDRESS WILL BE CHANGED ) Too many fake loan firms online. We remain the only loan firm that has made Our mission solving your financial problems and help your business succeed our priority.